Speaking of magazines, the current issue of CS Brides has an ad I put together for Bliss Weddings and Events. Which reminded me of another promotional project I worked on last year featuring Bliss: an entry for AdPack USA's annual tissue pack contest, in which copywriter Diane Landsman and I won the top prize: $6,000, which was not too shabby. AdPack USA manufactures pocket-sized tissue packs printed with your company's graphics. Super popular in Japan, they're starting to catch on in the U.S. as a creative way to get your name into the hands of potential customers. Maybe your business could benefit from this new medium? To read more about the campaign we designed, go to AdPack USA, choose Applications, and then click the Contest link. 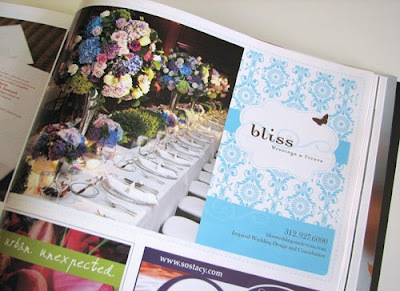 And if you're in need of an outstanding event planner, check out Bliss and get inspired by Renny Pedersen's gorgeous work. I just wanted to tell you I really enjoy your blog. I am so inspired by the things you post. Congrats on the ad win! Snuggies--would that be a backwards robe by chance? Don't they just make you laugh! Have a great weekend. Oh yes indeed. Everyone needs a backwards robe, especially to wear to sporting events like in the commercial. I'm "blissed" out that you designed an ad for Renny. Nice work. Just don't dis my Snuggie. I'm wrapped up in mine right now -- cozy as can be and my hands are free! I remember that ad...nicely done! That Bliss add was perfect. Not a wonder that it won. It was absolutely gorgeous. Well done! That's great! Love your blog! Have you heard anything about Domino magazine folding? I figured youi might know something! Snuggies? The outfits for modern monks? We love that commercial. We saw those snuggies on the tube today, and my bf commented on the backward robe. I said, you'd should have thought of it..4 mil sold. Wow. Stupid is as stupid does! You should contact the snuggie people and see if they would print your patterns on their products. Because I would totally buy one then. Nice work as always, your blog is one of my faves! I must guiltily admit, that I laugh along with my friends about how ridiculous the Snuggies are; when secretly I want one. Of course not even my mother would know I owned it, but once I am home alone I would break it out of closet for sheer enjoyment. My Snuggie dream. How exctiting to see your art/design work in a magazine! Gorgeous! My husband so wants me to make him a snuggie that is lined with silk!!! LOL, those Snuggies commercial crack me up too! I keep joking with my boyfriend that I'm going to buy him one next Christmas. wao!!!! Congratulations! 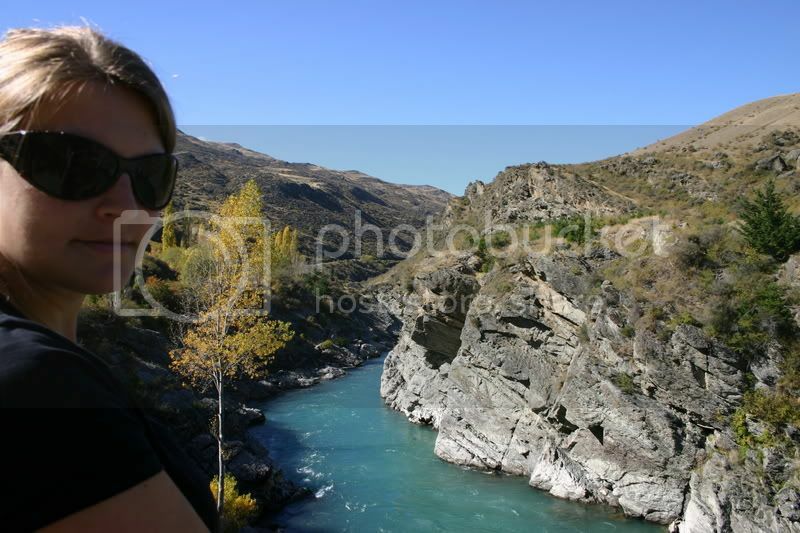 and great site! Thank you for the inspiration wonderful blog! what a clever concept! congratulations and $6000 will buy a whole lot o' snuggies. Yeah come on. well if it's a infomercial i just can't see it. LOL. That's so funny- my four year old JUST said in the car the other dya she wants a green(but red if they don't have green)snuggie for her birthday- in JULY! I had no idea what she was talking about, she had to describe it. I had seen the commercial but didn't remember the name. I know! I'm bummed, too. Now that you mention it, that does sound like what this post was going to be about! But since every other blogger everywhere commented on that, I opted not to. But I'm a little sad. Even though Domino's featured products are so very out of my price range, it was still fun to look at. i have wanted a snuggie for about a month now...really! congrats on the win! Great marketing ploy! We made our own, in orange and pink, for our wedding. Not quite as fancy or pretty as yours. Wow, Congrats. Nice work, I love the design. I studied abroad in Japan last year and you're right - these tissues are quite popular for the reasons that: 1) It comes in handy in the summer time when its super humid there! 2)When you're stuck in a packed subway. It'd be rude if you didn't wipe that sweat off your forehead and it got on a stranger. hehe. 3)You're walking around everywhere you go, so most likely you're hot and sweating profusely and need something to wipe yourself with. And more importantly, 4) you need it for the eastern style bathrooms there that does not always have toilet paper. =) I don't think we'll run into that last problem here in the states though. =D Just thought I'd share why its popular in Japan! They're popular over here too. Not only for business but politicians hand them out too. My friends and I call them politissues.